As we first discovered back in early February T-Mobile was preparing to launch in combination with Dell.com their next notebook, the Dell 14R. Also known as the Dell Inspiron 14R, the notebook will run on Windows 7 Premium edition. No word on what variant of HSPA+ this notebook will be running, however we could hold out hope for HSPA+ 42 Mbps but I’m assuming we might be a little early in the game for that. As mentioned back in early February the anticipated price for the Core i3, 2 GB Ram and 250 GB hard drive would be $399.99. 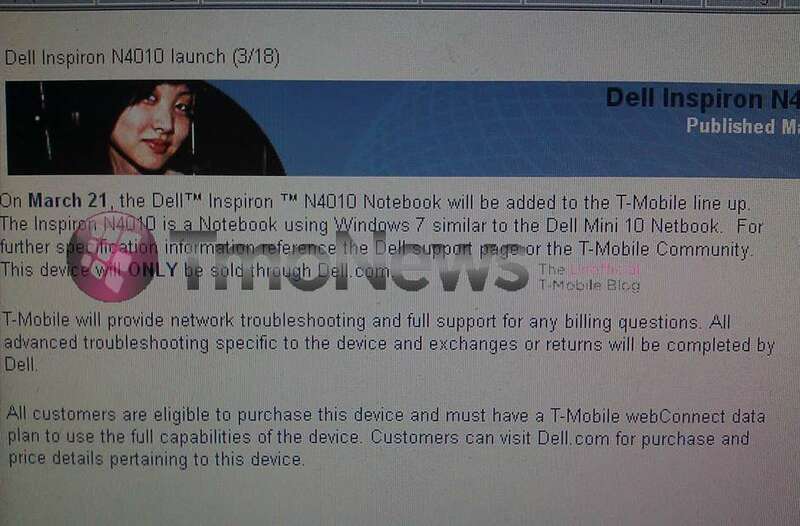 The Dell Inspiron N4010 wilt take advantage of T-Mobile’s newest webConnect offerings and will ONLY be sold through Dell.com. I think most people are looking for that G-Slate or Galaxy Tab 2 or other super sleek tablet instead of a netbook. I did say most and not all…. You are right I rather a Android table. Haha that Bueller part cracked me up. I have to watch that movie now. On topic, I just bought a laptop, so not really interested in a notebook. My girlfriend could use one though and she’s a big fan of T-Mobile. Netbooks don’t carry Core i 3 cpus and Android doesn’t run on x86 chips. This this is a full ultra portable laptop with built in web connect and finally a full pc that uses Tmobile’s internet!! Sick and tire of lusting for a laptop only to find out it’s not compatible with Tmobile! I think I see what u did there. why do you still continue to long for 42M. David read this slowly….so you can comprehend…IT DOESNT MATTER WITHOUT THE BACKHAUL. THEY HAVE NO PLANS FOR A BACKHAUL UPGRADE FOR YEARS. lol you’re incredibly retarded – they’re updating the backhaul daily where needed. Really, if you read the annual report, that is IF you can read you would have seen that they have suspended all backhaul improvements. He is a shill for the man. Tell me about it. Iphone lover. My phone makes me hot! I would rather be with a phone than a woman! Better yet, a 3D slate. CTIA is tomorrow and no leaks?? I wouldn’t expect much you already don’t know about, from everyone, not just T-Mobile.